VVA Chapter 850 members receive Kent County Medal! 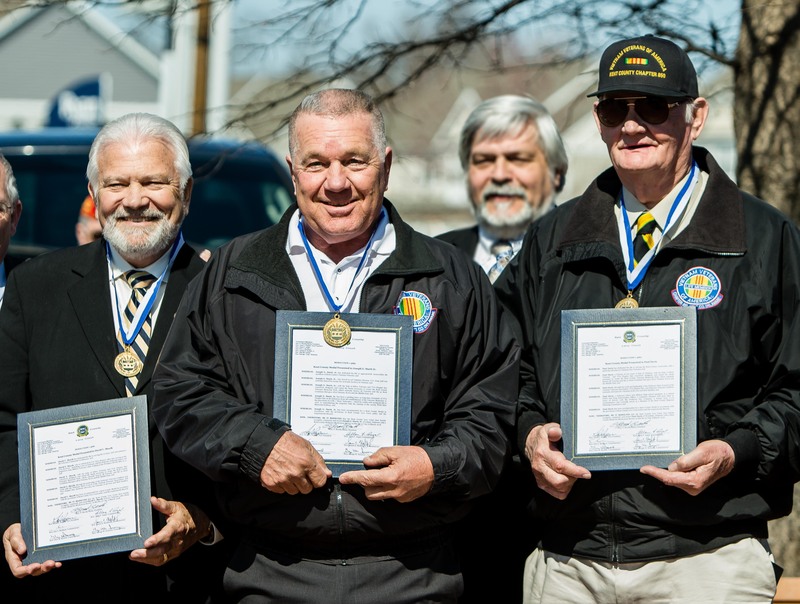 Home » News » Inside VVA Chapters » VVA Chapter 850 members receive Kent County Medal! DOVER, Del. 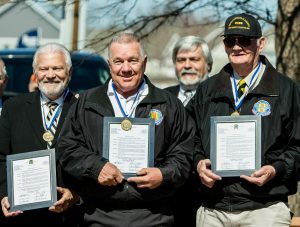 — At their annual Vietnam Veterans Day memorial ceremony at the Kent County Memorial Park in Dover, Delaware, on March 31, three members of Kent County VVA Chapter 850 received an unexpected tribute to their dedication and service, not just to fellow veterans but in outreach and education to the community at large. Each was presented with the Kent County Medal, the highest award bestowed by the county. Each played a leadership role in the planning and creation of the memorial, begun with the selling of bricks in 2007 after the county government ceded 1 ½ acres to Chapter 850 to build a memorial to Kent warriors lost in Vietnam. The Vietnam memorial was dedicated on Veterans Day 2009 but soon afterward chapter members decided to raise funds for other memorials, including Gold Star Mother and Families, and to those lost in Korea and the Middle East. In 2015 the chapter additionally dedicated a UH-1 Huey in tribute to Vietnam Dust-off crews — whom they later honored in 2017 by hosting their national convention in Dover. The chapter also dedicated a War Dog Memorial depicting a Dover AFB dog handler and his canine who had both spent two tours in Afghanistan and were awarded the Bronze Star. The final piece on the site is a POW/MIA Chair of Honor dedicated in March 2016. The chapter conducts three well-attended annual ceremonies in recognition of Vietnam Veterans Day, Memorial Day, and Veterans Day.